Dirty Harry, I just had a small part as a police officer inside a police car, with a couple of lines. But the one in Bullitt, I was cut out completely. There was a scene shot on Union Street in a little restaurant. Another actor and I were playing chess upstairs, and we do our little bit. The interesting part about that was that they had called for the interview people who were very good at ad libbing. They had guys from the Second City in Chicago and The Committee in San Francisco, which was an improvisational group. I had been doing a play called Under the Yum Yum Tree for about three years. 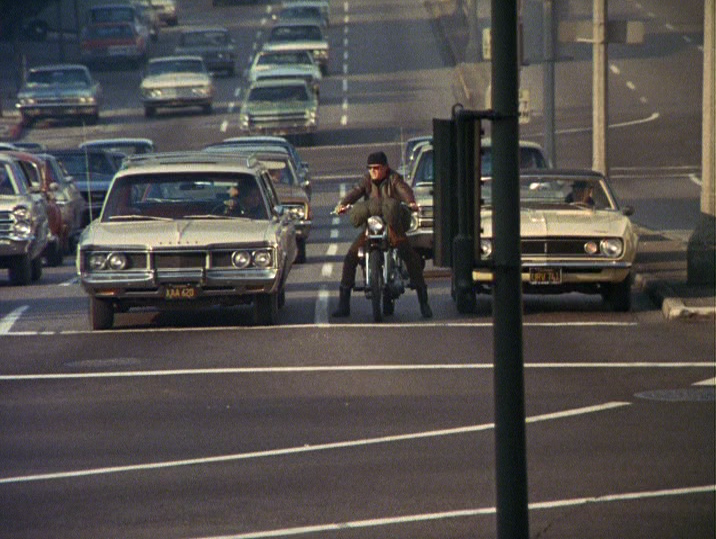 I was teaching school five days a week, and driving into San Francisco six nights a week. So they got around to me and I said, “I need a script. I’ve been doing the same show for three years!” But he hired me for whatever reason, and this other actor, who was in The Committee. And what was the ad lib that they interviewed for and needed this theater group to get? It was just, “Waiter, would you bring the wine, please?” They showed a little bit of that scene, but our particular [section] was cut out. I still get a little residual check from that, even though they cut me out of it. For Then Came Bronson, Klitsner performed his short scene with Parks at the intersection of Union Street and Van Ness Avenue. For the close-ups, they pulled over to the side of Van Ness, out of traffic. 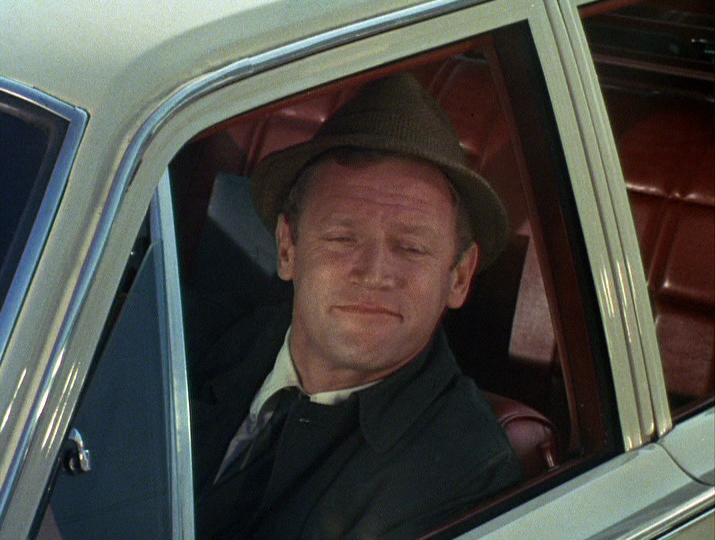 Klitsner drove his own car in the scene (which explains why it’s a station wagon rather than some vehicle more symbolic of the corporate rat race). At the time, he had no idea that the role would provide his fifteen minutes of fame. “About three months later, the agency called me and said, ‘Say, they sold that pilot and the producers decided that little bit you had was kind of the essence of the show,'” Klitsner recalled. “They wanted to keep it in at the beginning.” Klitsner received a weekly payment for the use of the clip. Just as he did in 1969, Klitsner lives and acts in Walnut Creek, California; a few years ago he appeared in a memorable scene in the Will Smith vehicle The Pursuit of Happyness. 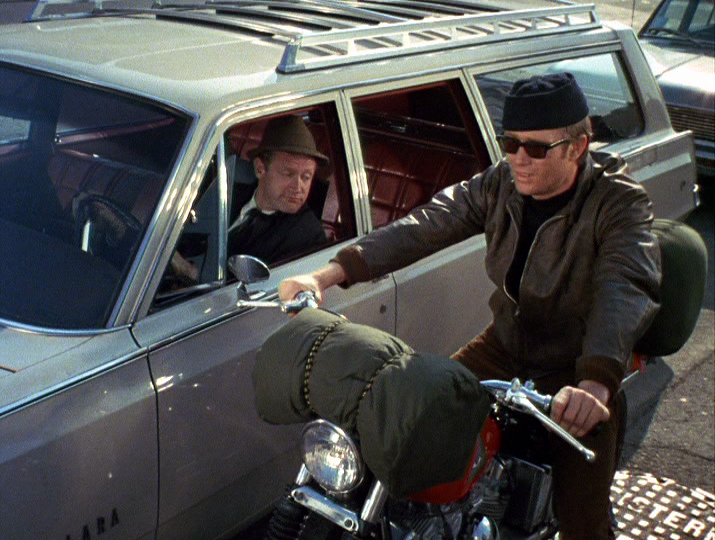 As often happens, my research on Then Came Bronson (and Michael Parks) turned up some interesting and previously unreported lacunae, so tune back in over the course of the next week or so for posts about those. Michael Lipton, a prominent Broadway and daytime television actor who dabbled in film and prime-time over the course of a five-decade career, died on February 10 at the Actors’ Fund Home in Englewood, New Jersey. He was 86. Although his death was reported locally, it seems to have been overlooked by the film and soap opera communities. I learned of Lipton’s passing only by chance, while researching the obituary I wrote for the writer Edward Adler last month. Adler’s late wife Elaine was Lipton’s sister. 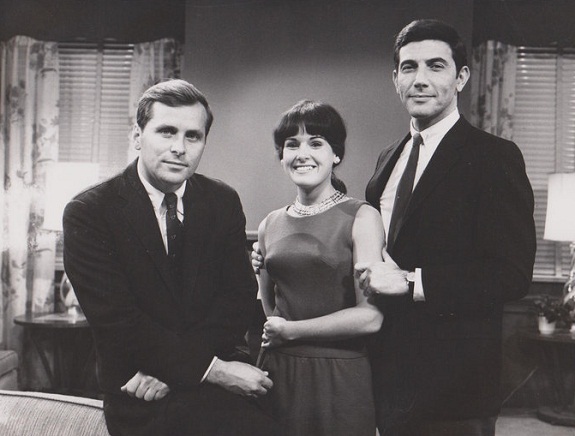 Lipton’s most substantial television work came in soap operas, where he had a long run playing Neil Wade on As the World Turns; according to this blog, from which I have shamelessly cadged the photo below, Lipton (right, with Peter Brandon and Deborah Steinberg Solomon) was on the show from 1962 to 1967. Lipton went on to star in Somerset for its entire run (1970-1976), and did a stint on One Life to Live in the eighties. 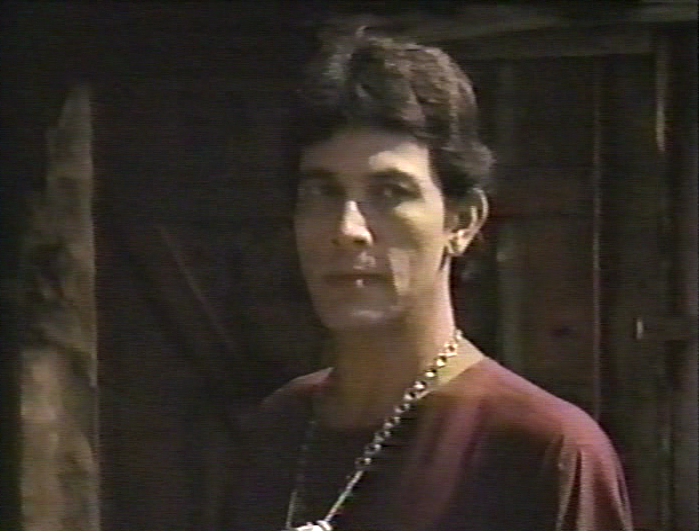 Lipton made his Broadway debut in 1949 as, essentially, a spear carrier in Shaw’s Caesar and Cleopatra and went on to larger roles in Inquest (1970) and Loose Ends (1979-1980). But the bulk of his theater work was done Off-Broadway and on the road, in stock and in touring companies of shows like The Moon Is Blue (1954) and Neil Simon’s The Gingerbread Lady (1973). It was in the 1969 Los Angeles production of The Boys in the Band that Ralph Senensky spotted Lipton and decided to cast him as a warlock in a Then Came Bronson episode (“Sibyl,” pictured at the top) he was about to direct. Actually shot in Phoenix, “Sibyl” was one of Lipton’s last forays to the Coast. His few films are all noteworthy – Leo Penn’s A Man Called Adam; Hercules in New York, the infamous “two Arnolds” (Stang and Schwarzenegger) indie; Network (as one of the executives); and Windows, the only feature directed by famed cinematographer Gordon Willis – and all made in or around New York City. Lipton’s first brush with Los Angeles, a feint at becoming, perhaps, a television star, had not gone well. In 1959 he accepted a male lead in Buckskin, a western whose real focus was on a fatherless child (Tommy Nolan). Child labor laws required Lipton, cast as a teacher, to play many of his scenes opposite Nolan without the boy present; he would ask the director for guidance, and be told to play the scene off a nearby flower pot. “To make sense while conversing with a flower pot that doesn’t answer,” Lipton told reporter Lawrence Laurent, “takes a lot of acting.” Lipton hung around long enough to play one more really good guest role, as a dandyish writer who confounds Steve McQueen’s Josh Randall in Wanted Dead or Alive, and then moved back to New York. Don Carpenter was a novelist who mostly lived in and wrote about the Bay Area and the Pacific Northwest. He published nine novels and a collection of short stories and blew his brains out in 1995, at the age of sixty-four. Lately Carpenter has become one of my favorite writers. I discovered him after his debut novel, Hard Rain Falling, turned up on a Village Voice list of unjustly forgotten books, and I think I warmed to his work because I was looking for some kind of continuation of the mind-blowing experience of reading Richard Yates’ Revolutionary Road. Carpenter’s writing is looser, leaner, and somewhat less depressing than Yates’s. But Carpenter works in the same mode of detailed psychological realism, and often employs the omniscient narrative voice that drives Revolutionary Road. Carpenter is relevant here because, like many other fine novelists, he made some unproductive forays into television which provide a provocative footnote to his serious writing. One of the most storied aspects of the Hollywood’s “Golden Age” is that nearly every world-class American writer – Faulkner, Fitzgerald, West, Chandler – passed through Tinseltown long enough to toil on some forgettable movies and gather material for their prose. To a lesser extent, a subsequent generation performed the same kind of journeyman work in television. John Fante wrote a (bad) script for The Richard Boone Show. David Goodis penned an Alfred Hitchcock Hour, and Jim Thompson racked up credits on Dr. Kildare and Cain’s Hundred. Joseph Heller, in the years between Catch-22‘s publication and its veneration, wrote for McHale’s Navy. Don Carpenter’s brush with television occurred in 1968-69 and encompassed two series that I know about, the western High Chaparral and Roy Huggins’ short-lived, hard-boiled private eye drama The Outsider. Carpenter had one script produced on High Chaparral, executive producer David Dortort’s followup to/ripoff of his mega-hit Bonanza, and at least one script done on The Outsider. I haven’t seen either of them. When I decided to write this piece, I felt an urge to track them down, but The Outsider remains a frustrating enigma (only a handful of episodes exist in private hands). And watching High Chaparral, I have to confess, ranks not too far above rectal exams on the list of things I’d care to spend my free time doing. One day I’ll put myself through it, I suppose, but don’t these exercises in grad student completism usually turn out to be fool’s errands anyway? Is anyone really going to find Heller’s soul crouched in the hull of PT-73? And if the junk vigilantism of Cain’s Hundred does bear some superficial similarity to, say, The Killer Inside Me, does that really mean anything? So far my favorite Carpenter novel is The Class of ’49, a kind of updated Winesburg, Ohio, that catalogs a series of formative incidents in the lives of a group of Portland high school seniors. Elliptical in its approach, The Class of ’49 runs to a mere 110 pages, and so its enterprising publisher bundled it with two unrelated short stories. The second of those stories is called Glitter: A Memory, and it draws upon Carpenter’s own adventures in the television trade. Carpenter wrote a lot about Hollywood, including a trilogy of novels – The True Life Story of Jody McKeegan, A Couple of Comedians, and Turnaround – that do not strike me as quite putting their finger on the movie industry with the same authenticity as The Day of the Locust or What Makes Sammy Run? or Fitzgerald’s “Crazy Sunday.” But, then, I wasn’t there, so what do I know? Maybe it’s just because I’ve done a lot of my own research on the television industry of the late sixties, but I think Glitter: A Memory is the most realistic (and most viscerally truthful) of Carpenter’s Hollywood stories. Glitter offers an account of the early gestation of a television pilot, the content of which remains largely undescribed (and irrelevant). It’s told in the first person by an unnamed “number two writer” on the project; the other two main characters are the pilot’s writer-creator and its young star, Felix Bilson, who has a reputation for being difficult to work with. Mainly the story recounts a single afternoon and evening of carousing on the part of the three principals, who bond across the industry’s well-etched class divisions after Bilson and the narrator find they share an affinity for pool. As with most of Carpenter’s work, Glitter doesn’t go where you expect it to: the bratty movie star is not a monster, but an artist who ought to be taken more seriously, and the narrative comes to an anticlimactic end in a nudie bar. The narrator pays a compliment to a stripper – “You dance beautifully” – and confides to the reader that he should have expressed the same sentiment to Bilson. What fascinates me about Glitter: A Memory is that it derives unmistakably from the creation of NBC’s Then Came Bronson, an unusual one-season drama about a rootless wanderer who travels the western United States on a Harley-Davidson. Carpenter dedicates the story to “Denne,” and that’s the key that unlocks the riddle. On High Chaparral, Carpenter overlapped with a writer and story editor named Denne Bart Petitclerc. If challenging storytelling was not a hallmark of David Dortort’s work, then one of his paradoxical virtues was a commitment to finding and giving opportunities to unorthodox, delicate, and outside-Hollywood writing talent. Petitclerc and Carpenter number among his discoveries. I’m certain that I’m safe in surmising that Petitclerc (who died in 2006) is both the “Denne” of Glitter‘s dedication as well as the character of the fictitious pilot’s primary writer, barely disguised with the name Dennis Grey Liffy. It was Petitclerc who wrote the March 1969 made-for-television movie that launched Then Came Bronson as a series the following fall. If the Glitter pilot is really Then Came Bronson, then Felix Bilson is Michael Parks. Carpenter creates a backstory for Bilson that draws heavily on the details of Parks’s life: the conspicuous resemblance (in looks and Method-y technique) to James Dean; the chafing under a restrictive studio contract and the contrarian attitude toward his executive overlords (read more here about Parks’ clash with Universal and Lew Wasserman); the career suicide undone by an “executive producer” (unnamed in Glitter, Herbert F. Solow in real life) who fought to cast Parks in his pilot. And the personal tragedies. Parks’ second wife, a small-part actress named Jan Moriarty, took a fatal overdose of pills in 1964; his brother Jimmy drowned in 1968. Carpenter, perhaps influenced by the Manson killings, combines those incidents into a single one, the violent, inexplicable and unsolved double homicide of Felix Bilson’s wife and brother. The events of Glitter take place in 1968, the same year during which Petitclerc would have conceived and written Then Came Bronson. All that really leaves to conjecture is how much, if any, of the drinking, toking, girl-chasing, and male bonding in Carpenter’s story (all of which is more complex and sympathetic than I’m making it sound) actually happened between Parks and the two writers. I can’t even hazard a guess as to whether Carpenter was a participant in Bronson at all, or merely an observer, or perhaps just inspired by some anecdote related to him by Petitclerc. The absence of any credited connection between Carpenter and Then Came Bronson doesn’t prove much; Petitclerc had nothing to do with Then Came Bronson after the pilot TV-movie he wrote sold, so once he was out, Carpenter (if he was ever in) would have been too. 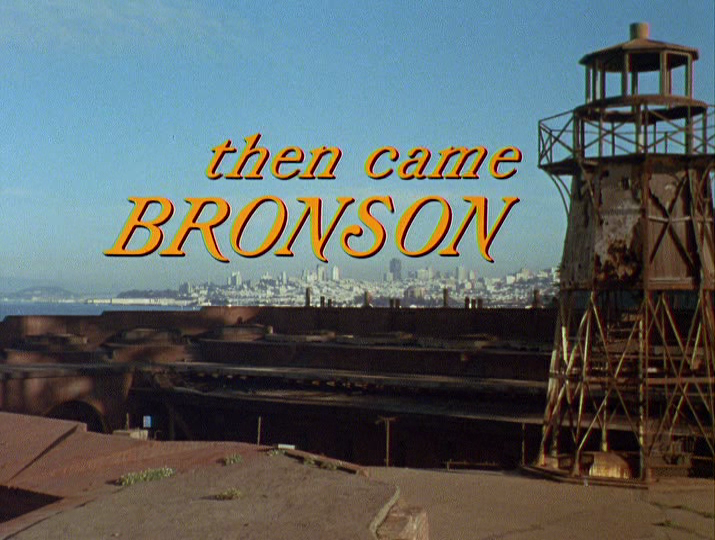 As it happens, the twenty-six episodes of Then Came Bronson get just about everything right except the writing: Parks is vulnerable and mesmerizing; the locations are often breathtaking, the imagery suitably Fordian. But the scripts rarely go beyond motorbike travelogue and into the air of wanderlust and uncertainty and change that was palpable in 1969. I have to wonder: what kind of a masterpiece could the show have been with Petitclerc and Carpenter at the reins? Thanks to the creators of the Don Carpenter Page and the not-updated-in-nearly-a-decade-but-still-hanging-in-there Then Came Bronson website. The prolific television writer Paul Schneider died on October 13. Schneider’s claim to immortality may be as the author of two pretty good episodes from the first season of Star Trek, “Balance of Terror” and the goofy “The Squire of Gothos.” A “haircut” of various fifties submarine movies, “Balance of Terror” introduced the Romulans, enduring Star Trek villains for four decades – even though, in a real “say what?” moment, the limited makeup budget necessitated that the Romulans look exactly like Mr. Spock’s race, the friendly Vulcans. Born in Passaic, New Jersey, on August 4, 1923, Schneider did some of his earliest writing on the Mr. Magoo cartoons. The syndicated situation comedy How to Marry a Millionaire was one of his first television credits, but for most of his career Schneider wrote for dramas and action or fantasy series. His resume is almost a list of the most popular TV programs of the sixties and seventies: 77 Sunset Strip, Wide Country, The Lieutenant, Mr. Novak, Kraft Suspense Theatre, Bonanza, Big Valley, The FBI, Ironside, Mod Squad, The Starlost, The Six Million Dollar Man, Eight Is Enough, and Buck Rogers in the 25th Century, among others. Schneider wrote his Star Trek scripts alone, but much of his work was done in collaboration with his wife, Margaret (also deceased). Together they seemed to excel in particular at medical dramas, penning multiple Dr. Kildares and at least a dozen Marcus Welby, M.D. scripts. One of the Schneiders’ Dr. Kildare segments, “One Clear, Bright Thursday Morning,” was a searing study of the fallout, both clinical and emotional, of the atomic bombing of Japan in 1945, and a high point of New Frontier-era television. Drake’s passing came less than a year after the deaths of both of Then Came Bronson‘s producers, Robert Sabaroff and Robert H. Justman, and its most prolific director, Jud Taylor. 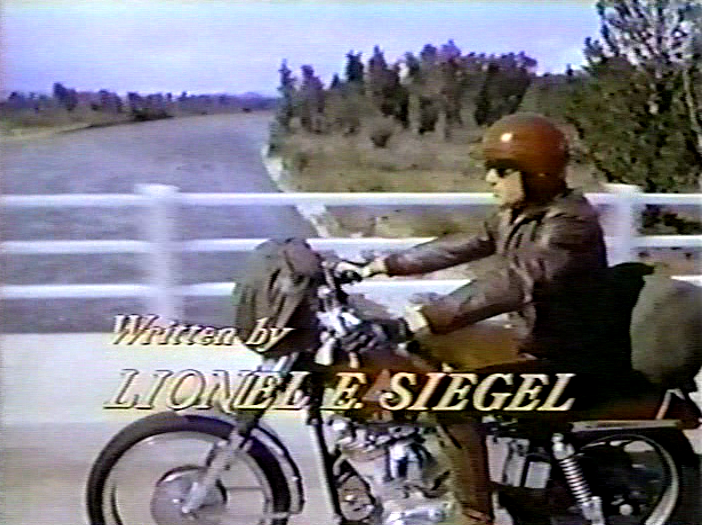 So we have probably lost the opportunity to see proper documentation of this ambitious, if not wholly successful, effort, which was mainstream television’s only really sincere effort to capture the vibe of the Easy Rider-era youth movement. But they didn’t quite finish. According to Roy Thinnes, the star of The Psychiatrist, the series had already been cancelled by the time “Par For the Course” went before the cameras, and the script had no usable ending. Producer/co-writer Freedman had already accepted his next gig, and his parting advice to the performers was, “Trust Steven” – as in Steven Spielberg, the episode’s twenty-three year-old director. With Spielberg’s encouragement, Thinnes and Gulager improvised a touching finale that was, in fact, wordless. Thinnes recounted this anecdote during the taping session for his Invaders DVD interview, and he told me that “Par For the Course” contained one of the finest performances of his career. It’s a shame the show remains locked away in the vaults today. The Vancouver-born Drake may have been better known as a folk singer and songwriter – credentials which perhaps led to his recruitment for the counterculture-oriented Then Came Bronson. Drake wrote a number of classic Kingston Trio tunes in collaboration with Bob Shane, one of the founding Trio members, as well as “Ally Ally Oxen Free” (using the pseudonym Steven Yates) with Rod McKuen. Together with future soap opera actor Michael Storm, Drake founded the Good Time Singers, a folk group launched on The Andy Williams Show that released albums on the Capital Records label. I dig the Trio, but I don’t really know enough to assess Drake’s importance as a musician. Perhaps my readers can enlighten me . . . . Thanks to Del Reisman and Gregg Mitchell of the Writers Guild of America.